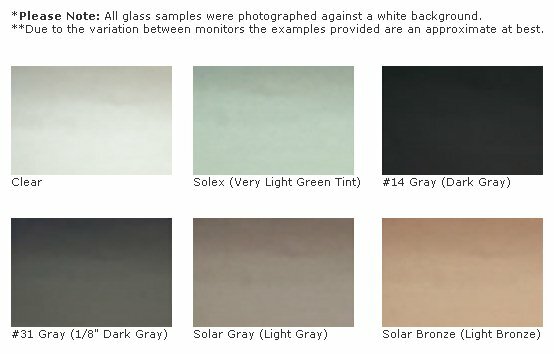 Solar Gray is the most popular tint for all around shading. Solex is popular for windshields and the Solar Bronze and Dark Gray tints are popular for customs, hot rods and limousines. The color for our laminated glass is in the laminate while our tempered windows have the color in the glass itself. No stick-on/peel off tinting here! If you’re not sure what color to choose, or would like to match what you already have, give us a call and we’ll do our best to match your existing glass. D.O.T. safety regulations require windshields to meet the AS-1 light transmission standard of at least 70%. Front vents and doors must meet the AS-2 light transmission standard of at least 40%. All other windows can be darker than 40%. Tinting laws vary state to state, so be sure you know what your state requires.